Litter is a constant problem in the woods and along the roads which run through them. Most of the litter is dropped casually by people passing through the area, but some is brought deliberately to be dumped there by "fly-tippers" looking for a quick and easy way to dispose of their rubbish. Debris is also washed into Gledhow Beck from the "Combined Sewer Overflows" (CSOs) during periods of heavy rain. As well as looking (and sometimes smelling) unpleasant, the litter provides real danger both to the people who visit the woods and the wildlife that lives there. Some commonly occurring items which pose obvious health and/or injury risks include broken glass; sharp and rusty metal; plastic bags; used sanitary towels, nappies, condoms, and drugs paraphernalia. Bigger items of rubbish which often turn up include shopping trolleys, bikes, fencing, old beds and other furniture. 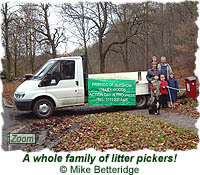 The Friends of Gledhow Valley Woods organise regular litter picking events in and around the woods, with skips being supplied by Leeds City Council for disposal of the collected rubbish. They are usually well attended and gain support of many local residents and other volunteers both young and old. 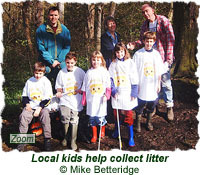 In 2001 local school children were encouraged to help with a special litter awareness campaign, and managed to collect 77 bags of rubbish in one weekend! 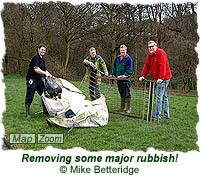 Most of the litter collection is carried out on regular Action Days organised by the Friends group. There is usually one Action Day each month, and the sessions last about two hours (although people aren't expected to stay the whole time unless they want to). Anyone is welcome to attend these Action Days, and all help is gratefully appreciated. All equipment that might be needed is supplied by the Friends, including gloves, spades, rubbish bags, litter picking claws, etc. For details of coming Action Days, as well as other Friends events, please see the News & Events section, and for more pictures of what goes on during Action Days see the Events Gallery.